We have a great range of chart types for you to use in your reports. Data tables are available for every question type. You will be able to see all relevant information for the corresponding question type, such as sums, averages, percentages, standard deviation, etc. In the case of open ended text questions, it will list all of the given answers one by one. 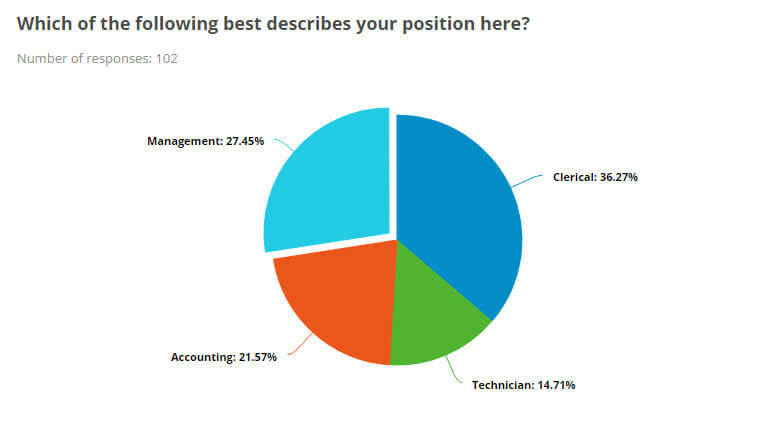 Pie charts are available to all closed questions such as multiple choice questions. It will show you the number of times an answer has been chosen, displaying both count and percentage. Donut charts are identical to pie charts, except that they have a hole in the center. 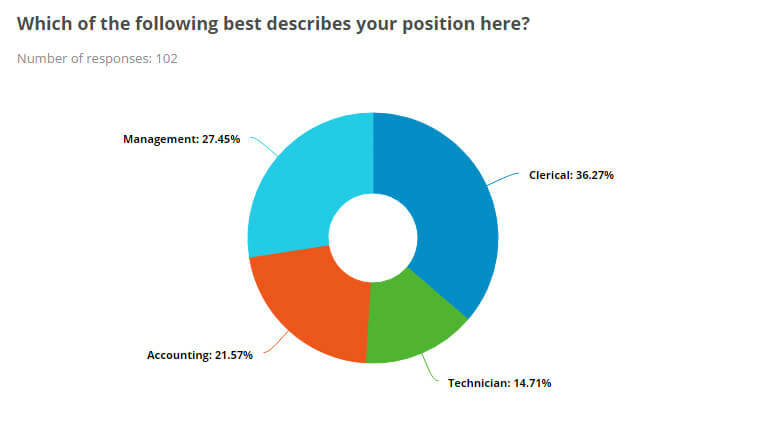 While they might look sweeter, donut charts can be more difficult to read than regular pie charts because it does not allow to compare the angles in the center of the chart. Bar charts are great because they are so easy to read. The different length of bars will immediately indicate which choices have been chosen more and which less. This chart type is available to multiple choice questions as well as table questions. Stacked bar charts are like bar charts, but combine all different answer possibilities into one bar. It gives a succinct view of how the answers are spread. This chart type can also be used for table questions. Same as the bar chart, but vertical. 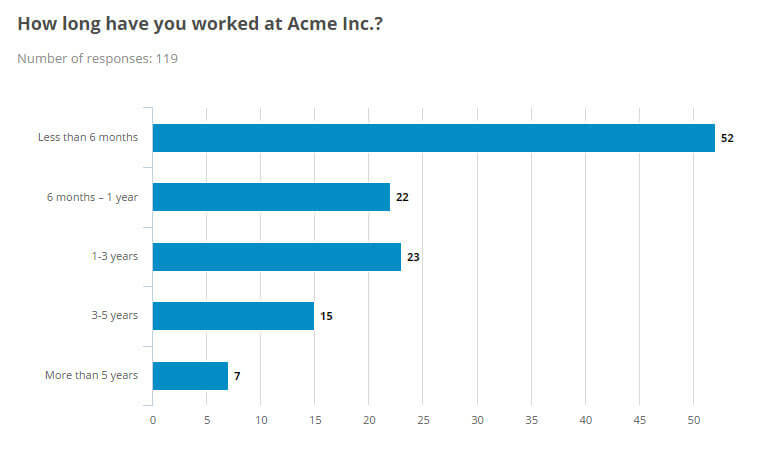 Every question type supporting bar charts does also support column charts, and vice versa. Same as the stacked bar chart, but vertical. 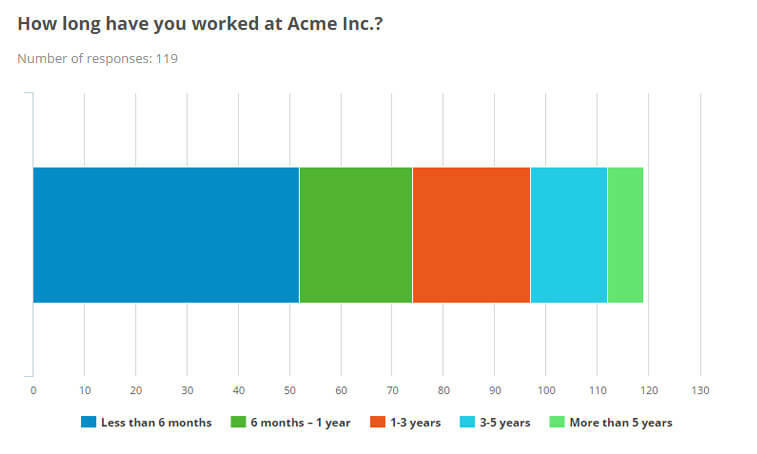 Every question type supporting stacked bar charts does also support stacked column charts, and vice versa. 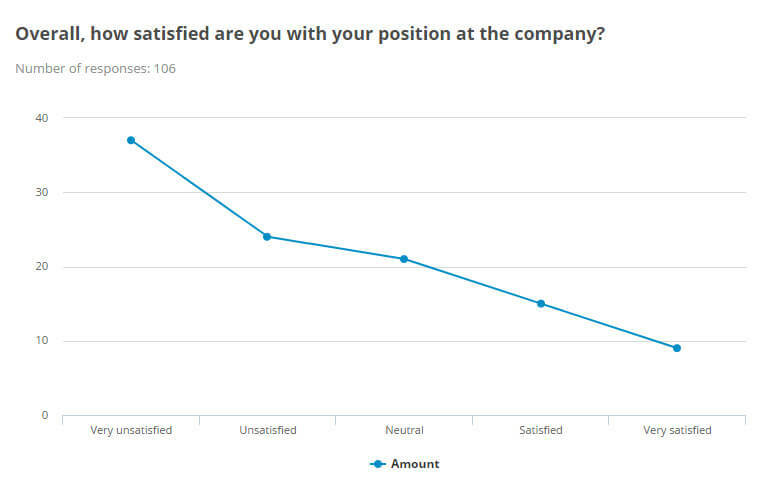 Range charts are especially useful for likert scales (e.g. from "very poor" to "very good"). 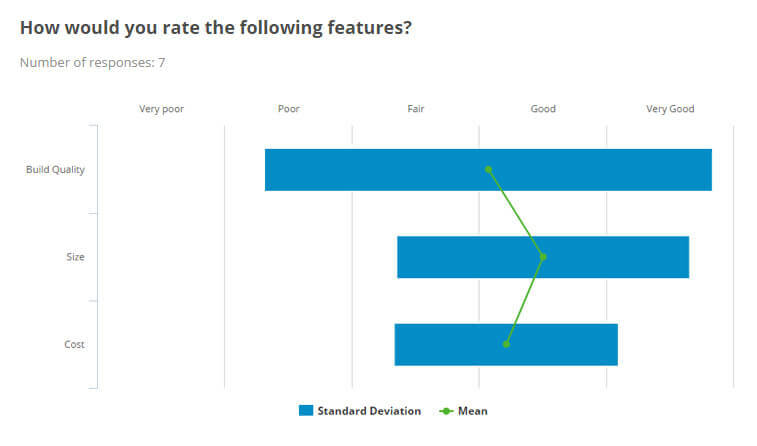 While the mean/average shows how an item is being rated across all participants, the standard deviation (SD) shows also how unanimous the answer is (small SD: participants agree, large SD: participants do not agree). The line chart or line graph is represented by a series of data points connected with a straight line. This chart type can be used with closed question types. Area charts or area graph work just the same as line charts, except that the area between line and axis is filled with color. A spider chart or radar chart is a graphical method of displaying multivariate data. This is available to closed questions as well as table questions. Wind rose charts work similar to (stacked) bar/column charts. It is especially useful to visualize table question with multiple answer possibilities per row. 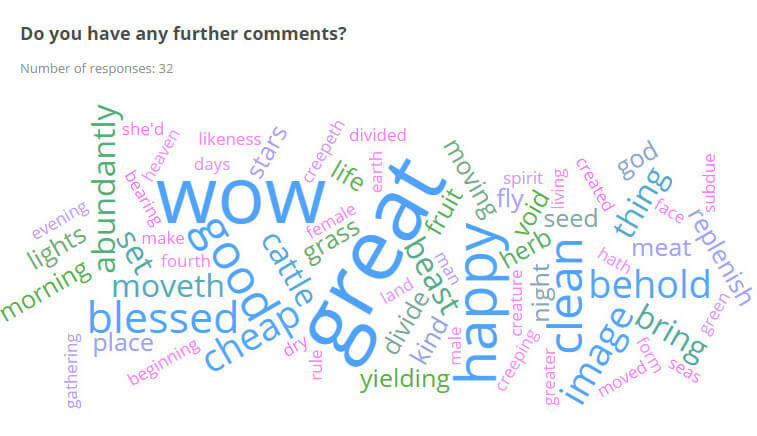 Word cloud or tag cloud charts are used with open text questions. It will parse all text answers given and return a visual representation of the most used words. The importance of each word defines its font size. 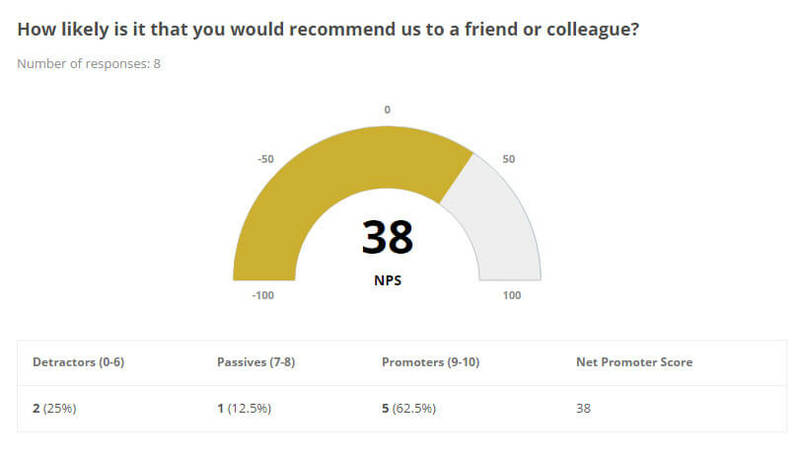 Net Promoter Score (NPS) questions require a specific way of evaluation. The NPS chart type is made specifically for this question type and will show the current Net Promoter Score, including details about detractors, passives and promoters.